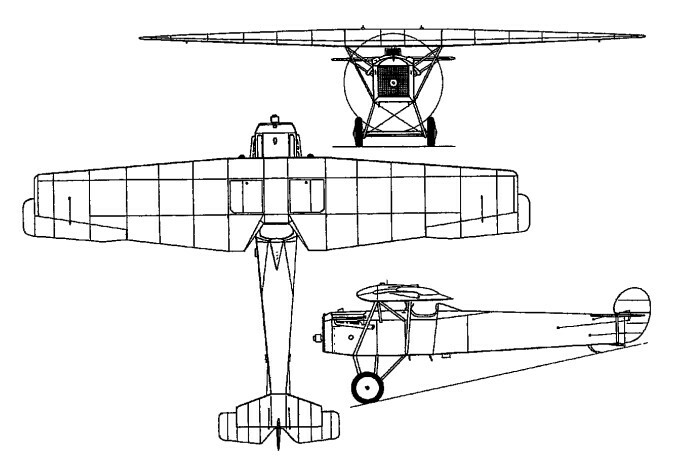 Evolved from design work undertaken in Germany for the V.37 during the closing stages of World War I, the F VI single-seat parasol fighter monoplane powered by a 300hp Wright (Hispano-Suiza) H-2 water-cooled engine was of mixed construction, with a one-piece plywood-covered wooden wing and a welded steel-tube fuselage. Two examples were ordered for evaluation by the US Army Air Service and were delivered in 1921, designation PW-5. Although the first of these crashed on 13 March 1922 as a result of a wing failure, a further 10 PW-5s were supplied to the USAAS that year. Armament comprised either two 7.62mm guns or one 12.7mm and one 7.62mm gun, and provision was made for small bombs to be carried on a rack beneath the fuselage.